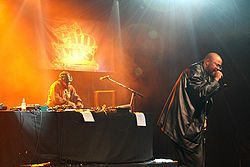 Blackalicious en vivo en el Paid Dues, 2008. ↑ a b Edwards, Paul, 2009, How to Rap: The Art & Science of the Hip-Hop MC, Chicago Review Press, p. 322. ↑ Shapiro, Peter, 2005, The Rough Guide To Hip-Hop, 2nd Edition, Penguin, p. 307. Esta página se editó por última vez el 11 abr 2018 a las 13:20.